Dr. Dina’s Mum and Dad were dentists. She grew up soaked in dentistry, Mum ventured into orthodontics. Dentistry is the daily endeavor. 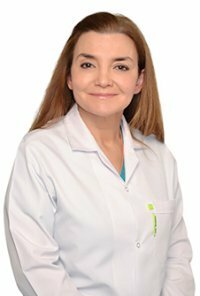 Dr. Dina was the first American Board Certified Pediatric dentist to move to Dubai. She started practicing in Dubai in 1991. She implemented standards of care in Pediatric Dentistry in different government institutions in the UAE (Ministry of health, DHA, DHCC) and trained a number of general dentists in dealing and providing quality care to children. She trained a large number interns and Senior House officers from government dental institutions for 18 years and residents from the Boston University Dubai Campus and the European University College for over 10 years. Dr. Dina served the UAE Pediatric community for over 27 years. She has grasped the true meaning of the Pediatric Dentistry profession: a specialty that provides primary and comprehensive preventive therapeutic oral health care for infants and children through adolescence. Chair side manners, compassion and quality care are key in the success of practitioners in specialist centers. She is fair in her expectations from young children and strives to establish long term and healthy relationship with her young patients. She does so by being transparent, the foundation of genuine human communication. Dr Dina and her team tend to patients from birth up to their early teens. Her team of Pediatric dentists has the training and experience to evaluate and treat patients that are physically or mentally compromised. This includes patients from within the Autism spectrum disorder: she is the center for referral for children within the autism spectrum disorder across the UAE. On a parallel note, her clinic is also the center of referral for major airlines. Dr. Dina’s ability to manage children’s anxiety and dental fears have made of her clinic the destination of choice. The latter is reflected through long waiting lists of patients, with patient scheduling spanning across months. For that she has taken up the task of imparting her ways to other dentist to deal with the high demand. She has trained both residents and former colleagues of hers. Dental procedures can be complicated due to the young age of the patient and the difficulty in performing quality dental work on the dental chair. For that, the use of conscious sedation is sometimes required. Children are awake and responsive when it is employed. The clinic is equipped with sedation facilities: both Oral (with syrup) and /or inhalation (with gas) sedations are available and ensure the smooth progression of the session. However, certain challenging scenarios require providing care under general anesthesia. Implementing Quality treatment planning and excellence in implementation can only then be achieved. These services are provide in hospital set ups where Dr Dina has established long term relationships with senior anesthetists. We tailor treatment plans and conditions to children’s needs. Finally, Dr. Dina’s Pediatric Dentistry Clinic is the only certified provider of the renowned no-brace orthodontic Myobrace treatment, across the UAE.